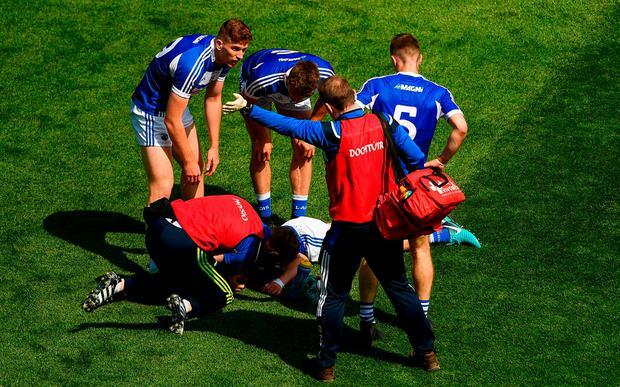 Laois captain Stephen Attride won't play again this season after suffering a fractured skull in their Leinster SFC semi-final win over Carlow in Croke Park on Sunday. Attride was removed from the pitch on a stretcher in injury time after an accidental clash with the leg of Carlow's Ciaran Moran. Attride was removed to the Mater hospital for x-rays with Laois football board chairman Laurence Phelan, a Killeshin clubmate of Attride's, revealing the extent of his injuries. "He's after getting the scans and they've been sent to Beaumount and St James'," Phelan told Laois Today. "He was knocked out for a couple of minutes and he has a deep gash - but he has a double fracture of the skull and he's unlikely to play football again this year," he said. "It's such a hard blow. It was an incredible act of bravery - one of the bravest acts I've ever seen - and it stopped a Carlow attack when they were driving on looking for a goal to level the game." Speaking after the match, manager John Sugrue also praised his captain's commitment. "Stephen is a very brave fellow, he has shown that a couple of times during the year. He came out for one or two balls, low and hard, where other fellows would not necessarily put their bodies," Sugrue said. "It is a sign of the man's bravery, unfortunately it cost him staying on the field until the end of the game but we got our reward and he made a massive contribution." The news leaves Sugrue with a significant hole to fill in his defence ahead of Sunday week's Leinster SFC final clash with Dublin at HQ. Attride has operated at both wing and corner-back for the O'Moore men this season with Shane Nerney, who replaced Attride on Sunday, and Darren Strong in contention for a starting spot against the All-Ireland champions. Laois are back in the Leinster final for the first time since 2007 when they went down to Dublin by six points. The midlanders have been installed as 33/1 outsiders to halt the Dubs' quest for an eighth provincial title on the bounce.